Peter Annable - born in Nottingham and has lived for most of his life in Nottinghamshire. After two years at Mansfield Art College he took up a career in graphic design. Since 1987 he has worked as a freelance artist, taking on graphic design and illustration work for industry as well as private commissions. He works in both oils and watercolour, the latter being his preferred medium. Peter enjoys painting from nature and believes the spontaneity and freshness of sketching on location is an invaluable experience when it comes to producing work in the studio. 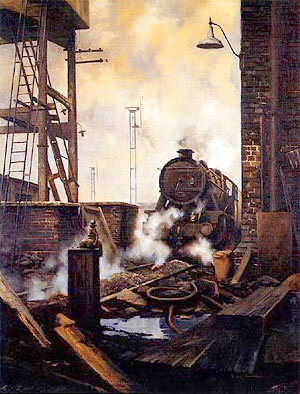 His railway subjects usually depict the final years of steam with the muck, grime and atmosphere associated with this period. 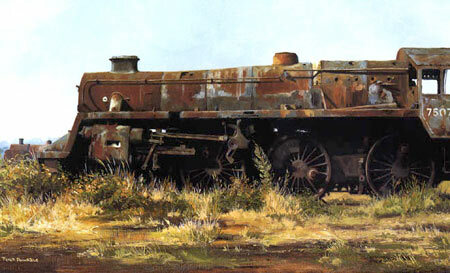 He has also made numerous visits to sketch and paint at Barry scrapyard. 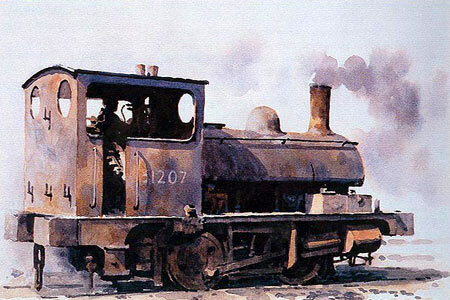 Other than railway subjects, he is a keen landscape painter and prints of his work are widely available throughout the country.